The Redlands’ reputation as a whale watching hotspot will be on show this Saturday during a traditional ceremony to welcome the whales at Point Lookout, North Stradbroke Island. Redland City Mayor Karen Williams said Yura Yalingbila (Welcome of the Whales) was an annual tradition of the Quandamooka People and one of the highlights of this year’s Quandamooka Festival. “Every year, thousands of humpback whales pass North Stradbroke Island between May and October, migrating north to breed in the warmer waters of the Great Barrier Reef before returning south with their calves,” she said. “This event is an opportunity to be part of a traditional welcoming ceremony for the humpback whales and wish them well on their journey from the best land-based whale-watching location in Australia. “Featuring the Yulu Burri Ba traditional dancers and live music from singer-songwriter Andrea Kirwin, BlackSalt featuring Georgia Corowa and Waveny Yasso, and talented local choralists from the Stradbroke Island Singers, it’s set to be a great day out for the whole family. 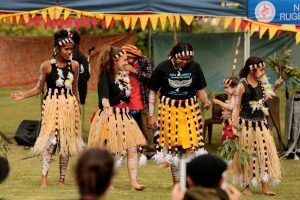 Quandamooka Yoolooburrabee Aboriginal Corporation (QYAC) CEO Cameron Costello said the traditional ceremony was a feature of the 2016 Quandamooka Festival. “Yura Yalingbilla is a key event of the festival. We come together with the broader community to share culture and celebrate the majestic creatures that inhabit Quandamooka waters,” he said. Division 2 Councillor for North Stradbroke Island and Cleveland Peter Mitchell said humpback whales were just one example of the plentiful marine life in the waters surrounding Straddie. “From the headlands at Point Lookout at this time of year, you can often see humpback whales breaching, dolphins riding the waves, and turtles and manta rays cruising through the waters,” Cr Mitchell said. “Point Lookout is an internationally recognised site for watching the migration of humpback whales, with scientists from the University of Queensland regularly undertaking a land-based survey of their migration as part of a long-running research project. Visit Quandamooka Festival for more information or Facebook for the latest details.